Most people cook eye of round too long, and therefore find it to be very tough. The secret is that it should be served medium rare. Think roast beef, not a roast. This recipe is fast, and delicious! Heat some olive oil in a cast-iron skillet over high heat. Season the roast and place it in the skillet, turning to brown all surfaces. Then put it in a 500-degree oven for 15 minutes; turn the oven off and leave be for 2 hours. "Season? ", you ask. You can use whatever you like. How about some of Paula Deen's meat rub. Today, I used Cracker Barrel Baked Potato seasoning! Yep! I think it's mainly kosher salt and some big flakes of black pepper. It was very good! Make sure to rub the seasoning into the meat. Preheat your oven to 500 F. That's HOT! until it looks like this. Mmmmm... it's smelling really good. Once you've got your meat browned, place it on a rack in an open roasting pan. Place the pan in the pre-heated oven and bake it for 15 minutes. Turn the oven off, and let it sit for 2 hours. NO PEEKING! Slice your roast thin, and serve, It's perfect. And on these hot days, you only need the oven on for a very short time. Hey, this is my first time noticing this blog! I love it!! Thanks! I've put this in the crockpot and never been happy with it.. apparently because I've been over cooking it! my oven only goes up to 250 degrees ... what do i do?? Mike, this isn't the recipe for you! You have to have a really hot oven to make it work...sorry. Does it matter what size roast you have or is 15 minutes enough for any size? 15 minutes is fine for any size roast! Hope it's good! I had stopped buying this cut because it was so tough. Then my husband did the shopping today and brought one home, so I hit the web for advice. After reading several websites, I tried this recipe but I incorporated something from another recipe also. I set the temp for 500 but turned it down to 475 when I put the roast in the oven. I also loaded it with diced garlic before putting it in the oven. It came out awesome. Hi, thanks for this recipe. Do you have any suggestions for how to also make baked potatoes along with this roast? Is it ok to throw them in with the roast without messing it up? I don't mind starting them out in the microwave but I do like them to finish up in the regular oven. They just taste better. As to baked potatoes, you could make them ahead, and hold them in a crock pot, or microwave them just to reheat them. This recipie it's only for eye of round which is a very hard muscle (worst part ot the meat to be roasted)but you can buy rib eye and cook it at 350 allowing 23 minutes per lb. Your instructions say to use a cast iron skillet to brown the roast but the photo is using a regular non-stick pan. Is the cast iron necessary and can you leave it in the cast iron to roast in the oven or does it need to be transferred to a roasting pan with rack as I do not have one? I really want to try this recipe asap. Your instructions say to use a cast iron skillet to brown the roast but the photos show a regluar non-stick pan. Can I use the cast iron skillet and just put it in the oven in the cast iron after browning or do I need to transfer it to a roasting pan with rack? I do not have a roasting pan with rack so what is a good substitute? Chandra, leaving your roast in the cast iron in the oven should work out perfectly fine. I will let you know how it turns out keeping in the cast iron. Thanks again! So here are the results: The Meat had a great flavor. I used Kosher salt, coarse ground black pepper, granulated onion and granulated garlic. My roast was 4 pounds so after browning it in the cast iron skillet for 2 to 3 minutes per side, I put the roast in the oven in the cast iron skillet. As soon as I put it in the oven I turned the temp down to 475 degrees and cooked for 28 minutes. At the end of the 2 1/2 hours I removed it from the oven and let sit for 20 minutes. It was more a medium/well doneness and I think that has to do with putting it in the oven in a screaming hot cast iron skillet. I would suggest to transfer it to a roasting pan for a less done roast. 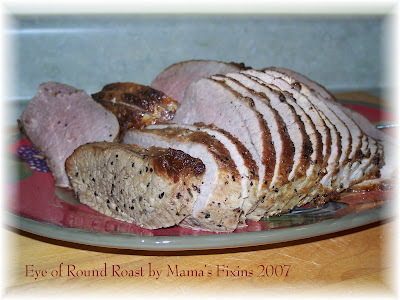 I will be doing this again soon as it was the best eye of round roast ever.